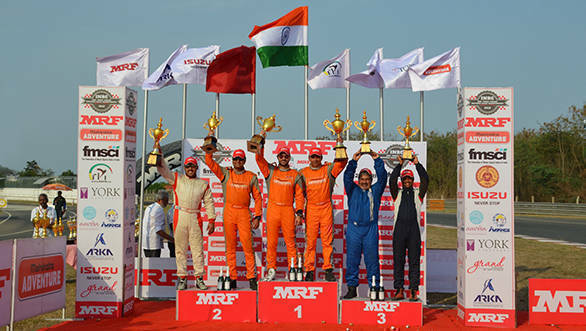 Gaurav Gill and co-driver Musa Sherif took victory at the 40th MRF South India Rally. It was the duo's thirtieth INRC victory together, and the first of the 2018 season, given that the Chennai round of the championship was the season-opener. Gill dominated the rally, winning all five stages on Day 2 to finish with an aggregate time of 1 hour 28:43.1 minutes. 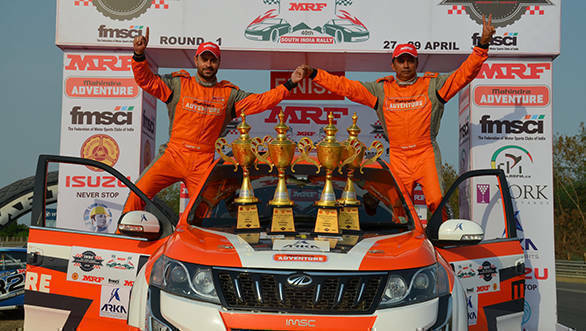 In what turned out to be a good day for the Mahindra Adventure Team, Gill and Sherif were joined on the podium by team-mates Amittrajit Ghosh and Ashwin Naik who finished the rally second. 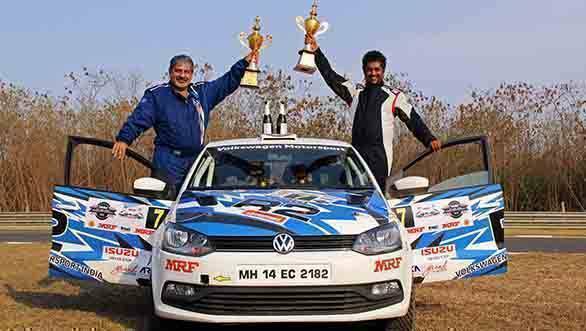 Ghosh and Naik went all out over the course of the last three stages of the rally to leap from third overall to second. Ghosh's aggregate timing at the end of the rally was 1 hour 30:39.6 minutes, an impressive performance given that he's still recuperating from injuries sustained in an accident in the 2017 season of the INRC. INRC 2 driver, Arka Motorsports' Karna Kadur took third overall. This meant that he and co-driver Nikhil Pai took top honors in the INRC 2 class, beating last year's winner Rahul Kanthraj. Victory in the INRC 3 class went to Vikram Rao Aroor and co-driver Somayya AG of Falcon Motorsports, who beat out their team-mates Dean Mascarenhas and Shruptha Padival. Speaking of his win Gill said, "We had a great day and hats off to the team who have put the car together. It is a brand new car and there were a few issues at the start but we overcame them and had a great weekend. It is a great start to the season and I'm glad with the win." INRC: 1) Gaurav Gill/Musa Sherif (Team Mahindra Adventure)  01:28:43.1 hours; 2) Amittrajit Ghosh/Ashwin Naik (Team Mahindra Adventure)  1:30:39.6 hrs; 3) Karna Kadur/Nikhil V Pai (Arka Motorsports)  01:30:59.4 hrs. INRC 1: 1) Gaurav Gill/Musa Sherif (Team Mahindra Adventure)  01:28:43.1 hours; 2) Amittrajit Ghosh/Ashwin Naik (Team Mahindra Adventure)  1:30:39.6 hrs; 3) Vicky Chandhok/Chandramouli M (VW Motorsport)  01:34:31.7 hrs. INRC 2: 1) Karna Kadur/Nikhil V Pai (Arka Motorsports)  01:30:59.4 hours; 2) Rahul Kanthraj/Vivek Y Bhatt (Arka Motorsports)  1:32:45.6 hrs; 3) Sumit Punjabi/Shahid Salman (Snap Racing)  1:35:53.4 hrs. INRC 3: 1) Aroor Vikram Rao/Somayya AG (Falkon Motorsports)  01:31:55.5 hours; 2) Dean Mascarenhas/Shruptha Padival (Falkon Motorsports)  1:32:37.3 hrs; 3) Fabid Ahmer/Fayaz Arakkal  1:33:00.5 hrs. FMSCI 2WD: 1) Adith KC/Suraj K  1:33:28.7 hrs; 2) Suraj Thomas/Sob George  1:36:29.5 hrs; 3) Ravi MS/Priyamvada Saradhi  1:41:17.5 hrs.